The course is full but a second session is being considered. If interested in signing up for a spring session, please contact the library and ask to be put on the waiting list. Former French teacher Thena Axiotis-Dahl, highlights basic phrases and customs in four sessions for adults. 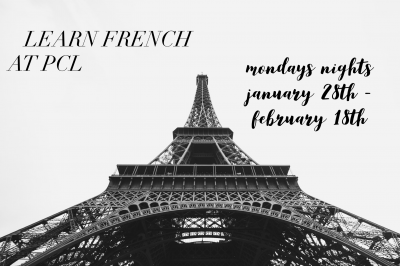 Enjoy French treats, learn how to get around confidently, how to order from a menu, as well as what never to do when dining in France! Mondays at 6:30 January 28th February 4th until February 18th 25th.